I was born in Taichung City on April 7, 1945. In 1982, I first came into contact with Buddhism when I was 30 years old. I was introduced by my refuge teacher to ven. Sheng Yin of the Ciming Temple in Taichung, under whom I was ordained and given the dharma name “Chang Lu”. In 1984, I was assigned as the director of Cilong Temple in Fengyuan, Taichung. I organized Amitabha chanting group practice and Water Repentance Dharma service, among other Dharma assemblies, on a regular basis. I gave lectures and talks at the county government, school, local communities and prison on their invitation, to explain and spread the Dharma. Because the original building did not have enough space, So I started the rebuilding of Cilong Temple un 1992. After three years the temple was completed. To promote and spread the Buddha’s teachings, the temple organized a variety of religious services and events. When there are natural disasters hit Taiwan, our temple proactively joined relief efforts to help. Since 2003, Cilong Temple has been awarded as a temple of distinction by the Ministry of the Interior on an annual basis. In 1996, my master Ven. Sheng Yin passed away. I continued his undertaking and started giving Dharma talks on a TV program titled “Sweet Dew of Compassionate Voice” at China Television Company. I also authored two books: Explanation on the Platform Scripture of the Six Patriarch and Explanation on the Sutra of Medicine Buddha. In 1999, Taiwan was affected by a major earthquake. Buildings of the Tzu-Ming High School, founded by my master, were severely damage. I helped arrange to rent a plot of land in the Taiping District to be used as the land for rebuilding the school and built emergency prefabricated housing as classrooms. In 2001, I was appointed chairperson by the Tzu-Ming board members. I then shouldered the heavy responsibility to relocate the school to Taiping District from Wufeng. As the reconstruction was costly. I remained vigilant over 3,000 days for raising the required sum of money. The difficulty and hardship involved was beyond description. The last there were completed and opened in 2010, make the perfect completion of the 10-year reconstruction period. We recruit excellent teachers, provide students with specialized and individualized teaching programs according to their capacities and tendencies, Because of our dedication to the excellence of education the school has been ranked be Taiwan’s Ministry of Education as a high school of excellent quality for many consecutive years, and evaluated as the “ First Class Outstanding School with the Highest Honor”. To help purify people’s mind and benefit the sentient beings, I set up Chung-Hwa Pu-Lu Merit Society in 2002 to organize charitable activities and events, to use Buddhist to purify human minds and to make propagate the Buddhadharma. Since 2005, Free Buddhist summer camps for children and teenagers, letting them know the importance of appreciation and giving, by introducing Buddhist Composure and conduct, and by allowing them to experience life education that inspires them to develop compassion. In 2002, I took over the position of abbess of the Fengyuan Temple, collapsed during the 921 earthquake and shouldered up the responsibility for its reconstruction. I renamed the temple as Baoyuan Temple, whose reconstruction completed in 2013. In 2002, I was awarded the 16th Promoting the Path Prize by the Association od Private School Education, and the PhD in Humanistic Studies by the Armstrong University, USA. In 2004 I was awarded the 25th New Century Zhongxing Art and Cultural Prize. I still remember the initial ideals when I first became a monastic and the vows to delve into practice and cultivation to achieve the true self and attain liberation. 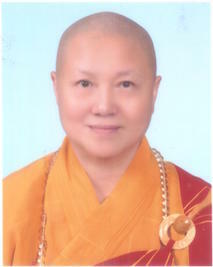 I hope to do my best to sow the seeds of good causes, to combine worldly undertakings with the mind of liberation, to nurture talent that have meritorious deeds, wisdom and well-rounded virtues, to allow the Buddha’s spirit of compassion and wisdom to prevail and to continue the development of Buddhist education in the hope of passing on the legacy to jointly create a pure land on earth, thereby realizing my humble aspiration to “enhance the sagely teachings, broadly form the affinities for the sake of correct Dharma, achieve the Bodhi-mind and accomplish the Samantabhadra deeds”.